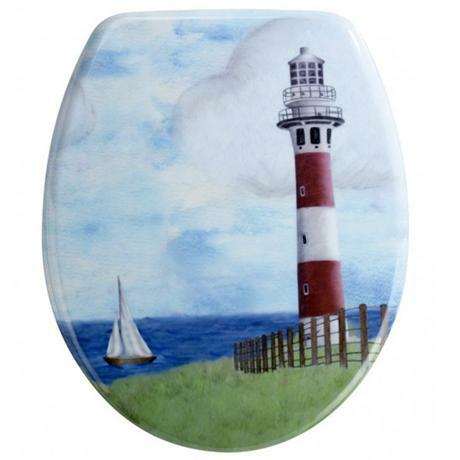 The Lighthouse Duroplast Toilet Seat from Wenko, made of high quality Duroplastic with a lighthouse image on and in the lid as well as on the ring. This product is a perfect fit and stays where you fit it, very well made and a pleasure to see in my en suite. The new toilet seat fits very well with our current bathroom colour scheme. It was very easy to fit and the fitting instructions were very clear. We were very pleasantly surprised to find that the pattern on the lid was also on the seat and on the underside of the lid. We would recommend this seller to our friends.